John Perry is an old man. His wife is dead, and he’s joining the military. ??? Certainly an interesting premise already, but it gets better. Scalzi’s main character is intelligent, with a wry sense of humor and maintains a humble likability as he rises through the ranks. An imperfect past grounds him and make him real, while the passion and love he felt for his wife never waivers. Which is good, because this is a very personal struggle by one man. And if he didn’t sell the book on his own standing, there’d be trouble. The technology ideas here may be old hat to some, but Scalzi uses them superbly—integrating them and making them a very real part of life and military maneuvers. Enhanced strength and speed? Check. There’s more, but despite a couple bits, nothing was jaw-dropping different. But it didn’t need to be. Really illustrates how important execution is. A good idea is nice, but will get you nowhere if you can’t sell it within the story. We’re past the day and age when an interesting idea can make a sci-fi novel; there need to be deep characters, a convincing setting and it needs to all...work. Humor is a solid reason to read this book. If you’re not laughing through their version of Boot Camp, then something is wrong with you (or perhaps Twilight is more your forté—yes...I went there...). 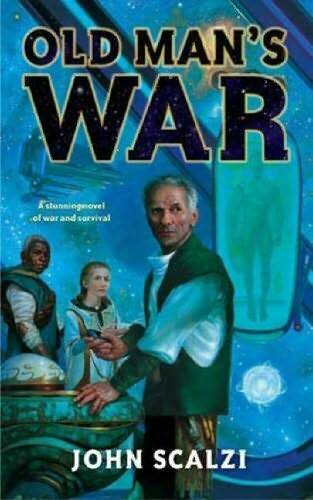 My one real complaint with Old Man’s War would be its lack of description. On the other hand, the narration is concise, amusing, and it makes the pages fly! There is no fluff in this book! Yes, I wished it had been longer and more detailed, but this is more a testament to Scalzi’s skill than a lack of sheer book to read. So, in most regards, it makes up for its sparse detail. However, due to its brevity and the large jumps in time the narrative can take, the reader is sometimes left with the White Room effect. (If not commonly known, I’ve heard reference to this before and it is simply the loss of connection to the setting and surrounding stimuli. This makes you feel like the current conversation is taking place in a Matrix-like loading space—and not in a cool way.) It is a testament to the quality of the dialogue, story and well-used technology that this is not a bigger issue. The story’s setting is huge with a propensity for an EPIC story. There are large scale battles and conflicts, cliff hangers, aliens up the wazoo, but it is not Space Opera. It is one man’s journey. That’s it. I didn’t find this to be a failing, but I did find it jarring when I realized the end was coming near and there was nothing earth-shattering in its conclusion. As a first book it is phenomenal, quick to read and leaves you antsy for more. What else could Scalzi have wanted for his first foray into fiction? It gets a solid 4.5 stars from me. I may be late to the game here and telling you what you already know, but for anyone that hasn’t read Old Man’s War... Go get it!